There’s just something about being out in the open that puts a smile on one’s face. However, the smile that stretches from ear to ear can quickly turn into a frown if you haven’t brought the right gear along for your outdoor adventure. Apart from the shoes on your feet and the GPS in your pocket, you are also going to need the best rain poncho for hiking to keep yourself dry because there’s nothing like a sudden downpour to ruin your day. A poncho is a sleeveless outer garment that has unsewn sides with space for the head to pass through. Made popular by Clint Eastwood (who wore one in every Spaghetti Western he starred in), it has been around for centuries and has been used by people in parts of South America to keep the body warm. In fact, it was one of the typical clothes worn by the Paracas, a pre-Inca culture that existed around 500 B.C. Inspired from the traditional poncho, a rain poncho sports a similar design but it is not made from wool or yarn. Instead, it’s designed from waterproof material such as nylon or vinyl with the primary function of keeping the body dry in the rain. Some designs also feature a draw-cord hood to ward off the wind and rain. While ponchos were first used by the natives of the Andes, they are now being used all over the world. Since not all rain ponchos are built the same, you will need to consider a few factors when choosing the right one. Whether you’re hiking through a forest or a mountainous region, taking one along for the trip will keep you safe from unexpected rainfall. Here are some of the advantages. The loose-fitting garment makes it easier to put on or take off. It’s the ideal length to protect your upper body and lower body from the rain. It’s lightweight and can cut down on the weight you carry while hiking or backpacking. Since it’s not going to be stuck to your body, it’s the preferred choice if you do not want to sweat while hiking or backpacking in warmer climates. A poncho is easier to put on a rucksack. This means you won’t have to drag along special protection to keep your rucksack safe from the rain. It also includes a hood and drawstring to protect your head from the rain. 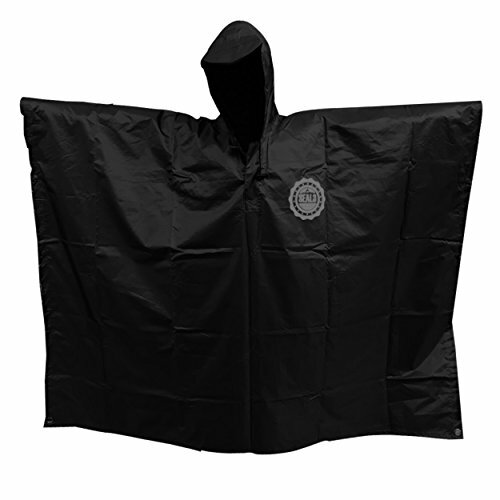 The sturdy design of the SEAL3 Rain Poncho means it’s not going to tear easily while walking in the bushes. While it does not have rip-stop nylon, it’s made from a high-density plastic that gets the job done. The poncho is also long enough to cover your arms, so they’re not exposed to the rain. People often complain of not having a zipper for the hooded area. You won’t have any complaints here since the SEAL3 Rain Poncho includes a zipper to help you slide your head in the hooded area. There’s also a nifty little flap to cover the zipper so that water doesn’t get to it. There’s also grommets on the four corners to make yourself a quick shelter from the rain. The jet black color and SEAL3 monogram makes this a more visually appealing option. The super lightweight SEAL3 rain poncho weighs just 1.2 lbs. Its all-purpose design makes it an ideal choice for an outdoor adventure or a backpacking trip. It’s been designed with 100% 190T ripstop taffeta, double-layer PVC for extra durability. Can be spread flat to create a waterproof picnic blanket that measures 7 x 4.5 ft.
Each of its corners features high-quality metal grommets which work as anchor points. Can be used as a backup tent or tarp during emergencies. Snaps under the arm to keep the wind out. It can also be used for fishing, hunting, or as a camping mat. Available in unisex and it can fit everyone over 4 ft in height. Available in four camouflage patterns along with several other color options. Comes nicely packed in a rugged bag with a sturdy zipper to keep it safe when not in use. While the SEAL3 rain poncho is sturdy, you wouldn’t want to depend solely on the multi-purpose design. Grommets don’t look like they can take much tension. Lacks grommets in the middle of the sides for extra protection. Fashion faux pass aside, the Frogg Toggs Ultra-Line Poncho has been built for one purpose only – to keep you dry once the sky opens up. 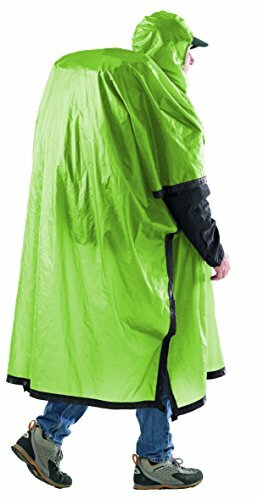 Constructed from ultra-light, waterproof, and breathable material, and featuring a hood and snap-down sides, this poncho is all business once it starts to rain, making you glad you brought one online for your hiking trail. Designed to be light as a feather while providing you with a sturdy and breathable companion for the outdoors. The non-woven polypropylene has a length of 36 inches and it easily reaches down to the knees if you’re a 5’8” tall male. The broad 54” width means that it’s easy to wear or take off while on the go. The large design makes it convenient to cover both you and your rucksack. It also features an adjustable hood with a drawstring to keep your head dry during the rain. Its one-size-fits-most design means it can fit almost everyone. A stuff sack has also been included to keep it safe when not in use. Both the rain poncho and protective bag have been made from reusable material. The Frogg Toggs Ultra-Lite Poncho has clearly not been designed for the fashion conscious. The material is prone to snagging. Only available in two colors (khaki and dark green). 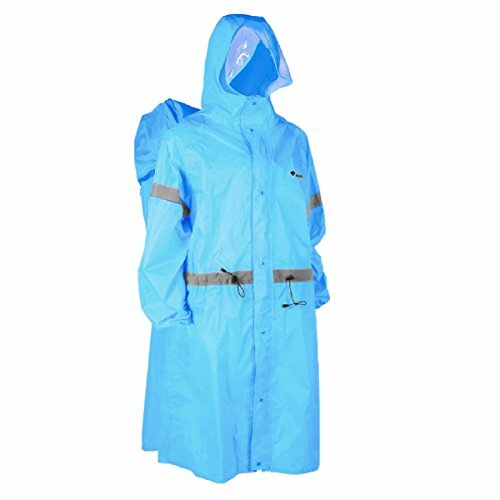 The Sea to Summit Ultra-SIL Nano Tarp poncho has been designed from windbreaker fabric to provide decent coverage. While it weighs slightly more than your average poncho, its versatility makes it worth carrying. It features a sturdy design, with rounded edges, but no tabs for guy lines. To make up for it, you get waterproof seams that are tape sealed and double stitched. It can be turned into an efficient tarp, but you are going to tag along your own line points. The best part is that the siliconized exterior won’t get soaked even under heavy downpour. Weighs just 6 ounces, making it easy to carry for long distances. Built from lightweight nylon 15D Ultra-Sil fabric, it offers impressive waterproof properties. Specially designed to protect a large rucksack from damage due to rain. The sides snap together for added protection during the rain. The versatile design means that it can be used as rainwear for one person or as a two-person shelter from the rain. It’s reinforced with a double-stitched, tape seal for extra durability. The 3-panel hood construction offers better protection from the rain. Can be used as a raincoat, groundsheet, tarp, and pack cover. The design does not provide protection to the arms. There are no tabs for guy lines. Prone to getting snagged by bushes. The ultra-thin fabric is easy to tear. The Terra Hiker Rain Poncho features premium waterproof function, thanks to its 210T high-density polyester fabric. All of the seams have gone through a special caulking treatment to enhance its waterproofing capabilities. You also get thickened eyelets and Velcro cuffs on both sides for maximum comfort. For added protection, you can try adding paracord corner ties with knots close to the eyelets’ corner. The knot can be pulled to the front from the hole at the back tie for better protection against the wind and rain. 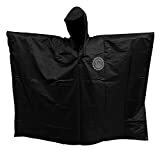 It measures at 26 x 8 x 3 cm and weighs just 0.58 lbs., which is lighter than most other rain ponchos. The breathable rip-stop fabric makes it comfortable to wear even in hot climates. Its long length means that it reaches down to the knees. The spacious back makes it easy to keep a 60-liter backpack from getting wet. The cap margin sports an elastic rope which means better protection from the elements. The multi-purpose rain poncho can be used for picnics, fishing, and protecting against the rain. The adjustable collar makes it a one-size-fits all option. Can double as an emergency flag if needed or can be transformed into an effective tarp. The lightweight fabric is not as sturdy and can easily get damaged with a sharp object. The rain poncho offers limited coverage to the hands. One of the stand-out features of the TRIWONDER backpack Rain Poncho is its reflective stripes on the waist and arms that makes it easier to spot in low light environments. The extended TPU brim design is not only transparent, but it can also increase your field of vision, making it easier to hike with. The addition of elastic support around the sleeve openings keeps wind and rain at bay. It also sports a rather large raincoat tail that makes it easier to walk in. It also features a two-way zipper that’s great for carrying thru-hiking ultra-light gear. The TRIWONDER reflective backpack rain poncho has been designed from premium quality 200T Polyester Taffeta. Features reflective stripes on the arms and waist for extra safety while hiking or backpacking at night. Features an extended transparent TPU brim design that’s designed specifically to protect the backpack from rain. Extra support has been provided with elastic design around the sleeve openings, with is great to shield the hands from rain and wind. The multi-purpose design can be used for hiking, climbing, and backpacking. Features a double zipper which helps improve air circulation while worn. Features a bottom crescent moon design which makes it easier to walk while hiking, backpacking or climbing. Not as lightweight as other rain poncho designs. Prone to leaking at shoulder seams. It might not be the most stylish option available. The bright orange color may seem gaudy to some users. 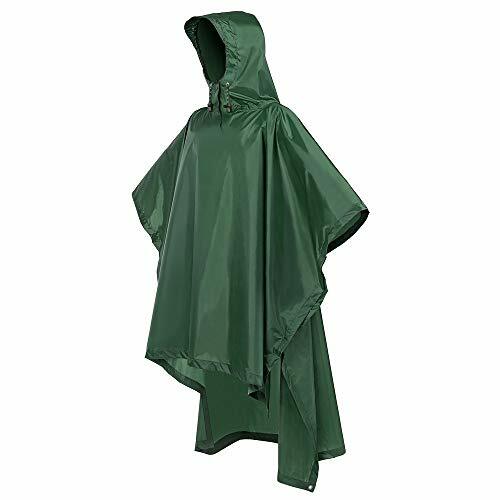 The Mil-Tec Waterproof Hooded Nylon Poncho has been made from 100% waterproof and rip-resistant nylon material. Weighing in at just 630g, it is extremely light and durable. With a length of 84” it easily reaches below your knees, providing you with a decent amount of coverage and protection from the rain. 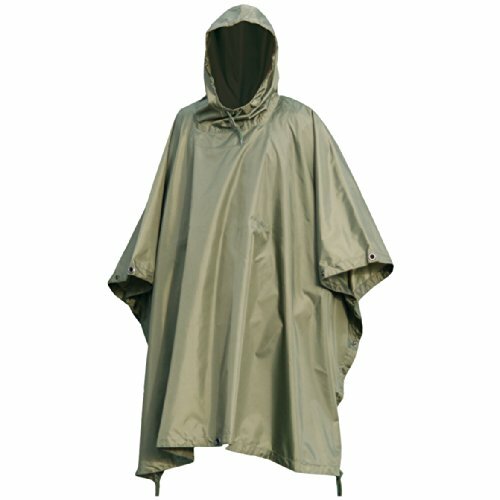 What makes this poncho from Mil-Tec unique is that two of them can be snapped together to form a makeshift tent. It’s called Ripstop because of the special weave that runs through the material. Long and wide enough to cover a large area as a tent floor. Military-grade material offers better protection against rain. Long length reaches the knees of a 6-foot tall person. Features a draw cord hood that’s easy to use. Snap buttons on the sides to keep the water out. Features 6 brass eyelets and press stud poppers for more versatility. Easy-to-use poppers makes it easy to handle equipment while wearing. You also get a nice carry bag to keep it safe and clean when not in use. Could be expensive for some users. Its large design means that it’s not suitable for short people. We all look forward to bright and dry weather when planning a hiking or backpacking trip outdoors. But, more often than not, we are met with the unpleasantness of rain. 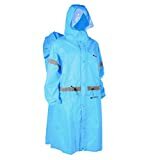 While packing a rucksack with an umbrella is going to be out of the question for a hiker, the next viable option is the best rain poncho for hiking. The Verdict. 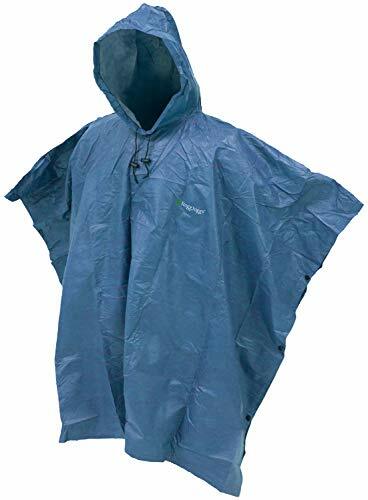 After going through all of the options mentioned above, the one that stands out from the rest as the best rain poncho for backpacking has got to be the SEAL3 Rain Poncho due to its all-weather design and the fact that it can fit almost anyone over 4” ft tall. Other features that make this a sure winner is the 100% 190T ripstop taffeta and the double layer PVC material, which makes it extra sturdy and offers better water protection. It’s also fairly large, measuring at 7 x 4.5 ft for its meager 1.2 lbs weight.